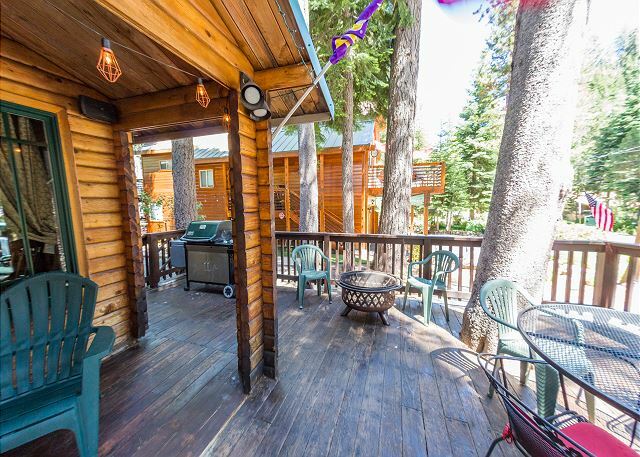 Truckee, CA United States - Patout 066 | Donner Lake Realty, Inc. Vacation rental cabin / bungalow. Sleeps 6, 2 bedrooms, 1 bathroom. Dogs allowed. 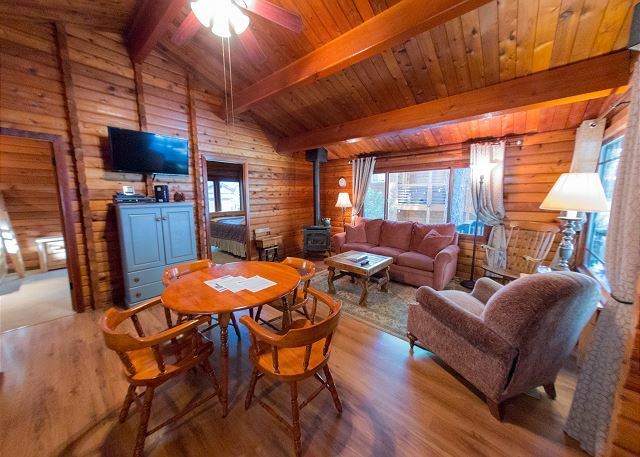 This classic Donner Lake log cabin is new to our program. 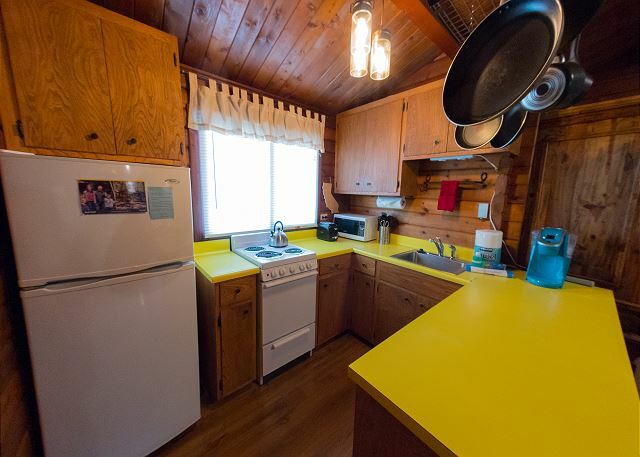 It is a one story, 2 bedroom, 1 bath and sleeps 6 and is Pet Friendly. It has parking for 3 cars. 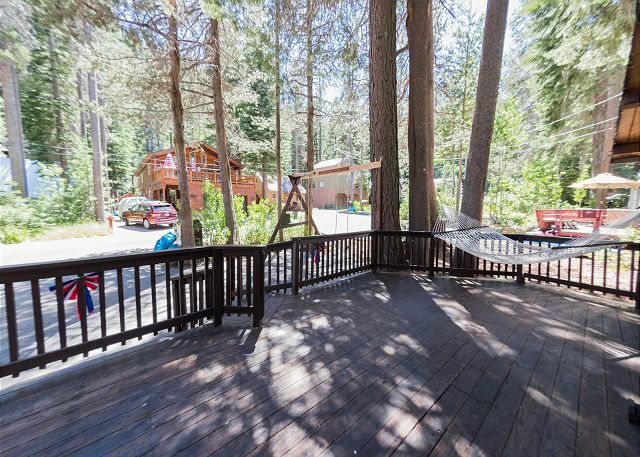 Once you park in the paved driveway you walk up 3 stairs onto the big front deck to the front door. You enter the cabin to the living room/dining area. Relax in the living room watching TV on the new flat-screen TV while enjoying the heat and ambiance of the gas stove. 2 people can sleep on the Double sofa sleeper. The kitchen is located to the left of the living room featuring a Keurig coffee maker. The laundry area is off of the kitchen on the left. If you walk through the living room to the right side there you will find the master bedroom, which has a queen bed. To the left is the kids room with a (single on top, full on bottom) bunk bed. The bathroom is off the left of the living room. It has a shower stall only. This unit rents with a floating 2 night minimum during the summer and winter. Our units do not have sheets, pillow cases, or towels included in the rental, guests are requested to bring their own. However, we do offer linen rental service with 72 hrs notice before arrival: sheets, pillow cases, and towels at a onetime fee of $10 per person. Check in time is 3pm and check out time is 10am. **Nightly Minimum Subject to Change for Holidays** 4 night minimum for Thanksgiving, 7 night minimum for Christmas/New Year's, 3 night minimum for Martin Luther Holiday Weekend, 3 night minimum for Presidents Holiday Weekend, 3 night minimum over the 4th of July, 3 night minimum for Labor Day holiday Weekend. Discounted rate for stay of 7 nights or more!